Update of the FIFA-world-ranking in April 7, 2016. 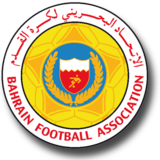 Bahrain national football team, the position on the FIFA ranking is the same as the previous month. Bahrain national football team remain ranked 271nd in FIFAranking. The team has 271 points. This page describes the FIFA rankings and point of Bahrain national football team. Here is two charts, an upper chart is Monthly transition of the two-year results. (Up to two years) The lower chart is Yearly transition from 1993. Copyright© FIFA world ranking – table & charts , 2016 All Rights Reserved.